A place to preserve all manner of interesting snippets of information, be they text, images, audio or video. 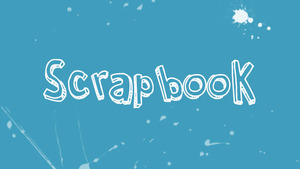 Much like with a physical scrapbook, you'll find here an odd assortment of ideas and concepts that simply do not fit anywhere else. A medium to capture content that may not warrant in-depth analysis or discussion, but might be worth keeping for posterity nonetheless. As a collection of b-sides and other rarities, these clippings, cuttings, extracts and excerpts offer a unique look at events related, however tangentially, to Sidepodcast. A while back, Journeyer posed a question about what music was listened to at Sidepodcast HQ and we promised to make a playlist or two to demonstrate. Unfortunately, we didn't get round to it but now we're delivering on that promise (sort of). During the past week, I listened to Apple Music's attempt at a Christmas playlist that had one or two classics but for the most part featured party songs, tangential festive tunes, and those slowed down advert covers that are so very popular these days. In an effort to promote the upcoming Austrian Grand Prix, Red Bull decided to hitch up a caravan to two Aston Martin and get their drivers to go round the Spielberg track... and see what happened. Now, we all know this is going to end up like an episode of Top Gear, but even so, it's worth a watch. As part of Renault's ongoing celebration of four decades of racing, current driver Nico Hülkenberg travelled back in time to see what clothes, music, Renault cars and of course, motorsport was like back in the 1970s. Alain Prost is on hand to guide Nico around the Paul Ricard circuit, and there's a surprise guest on hand to give Nico a run for his money. Lewis Hamilton has a history of making cameos in Pixar's Cars film series, and with the upcoming third outing of Lightning McQueen in Cars 3, it looks like the F1 World Champion has a new role to play. In what appears to be the first of a new series, Toro Rosso have posted a video with their drivers Carlos Sainz and Daniil Kvyat going head to head in the kitchen. It's probably not the natural environment for these two, who are more used to zooming around at 100mph, but the competition element clearly bubbles up straight away. With a number of days free this week, we tried to make the most of our downtime. In addition to tidying up a few loose ends on this site, we managed to record a number of podcasts and experiment with some new mobile technology. Early Wednesday morning motorsport folks lost their collective minds at the news Fernando Alonso will be racing the Indy 500 this year. Initially I was quite excited at the idea of a current Formula 1 racing driver switching series mid-season, but as the day wore on it became clear I wasn't anywhere near as excited as everybody else was. Mercedes have been doing a fantastic job so far this year providing extra insight and access to the paddock for fans at home - helped along by the somewhat relaxed social media rules from Liberty Media. One of their treats from Shanghai was a brief moment with both Hamilton and Bottas as they made their way to the driver's briefing. Another season, another round of car launches and another sad realisation that F1 teams aren't very good at marketing their own machinery. Bless them they try their best, but where the motoring industry leads the field in photo-realistic CG car launches, the pinnacle of motorsport offers up anything but that. Super Bowl commercials regularly run the full gamut from terrible to amazing, but Audi's 2017 offering is up there with the best. From the start line to the finish, it is a work of art: the two boys disregarding the real competition, the fantastic catch through water and the genius of the handbrake save. If you ever peruse the internet in search of motorsport news you could be forgiven for thinking that every site just copies from the next. 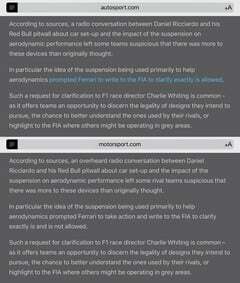 The team at Autosport seem to be out to prove the point today, posting content lifted directly from Motorsport.com. Following the 2016 Formula One season finale, and at the end of his lengthy F1 career, Jenson Button had a new reason to celebrate. The McLaren racer was given an honorary degree from the University of Bath, promoting him to Doctor of Engineering. And, in his own inimitable style, Button grabbed on to that honour and wouldn't let go. Canadian IndyCar racer James Hinchcliffe has only gone and made it to the final of Dancing With the Stars, and he did it with this motorsport themed jive. Oddly, and unlike the British version Strictly Come Dancing, James got to dance this tune with two professional partners, which makes things a bit confusing if you ask me. It's been a while since we saw an episode of McLaren's animated series Tooned (and even longer if you discount the dodgy Mobil 1 nonsense) so imagine our delight to see a fantastic episode featuring the new lineup of Jenson Button and Fernando Alonso. These two have great chemistry and it's a great script, making this one of the better episodes of the series. The entire Red Bull team are in a pretty good mood heading into the Japanese weekend, after picking up a race victory and double podium finish in Malaysia. Christian Horner has been talking about the good feeling in the team, and even bigging up their prospects for the coming seasons, as he's said he would be able to manage his two competitive drivers if they were to go head to head for a championship trophy. 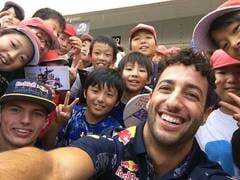 You would forgive the F1 drivers for taking some time off after the chaos that was the Chinese Grand Prix, but for Daniel Ricciardo, the last few days offered up a new opportunity for some racing action. Challenged by Felipe Massa's six year old son, Felipinho, Daniel Ricciardo accepted the call to arms for a head to head kart race. Ahead of testing next week, and perhaps partly to distract from Red Bull's livery launch today, Renault revealed their plans for the first week in Barcelona. 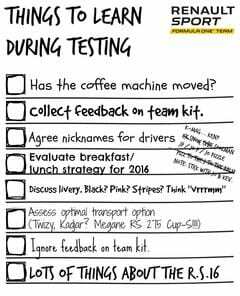 As you might imagine, a lot of thought has gone into this checklist, so that the team can really understand what they have brought to the track in the shape of the RS16 and what it can deliver for them this year.